When Medical Marijuana was enacted in Illinois, the DUI laws were changed to address Medical Marijuana. If you are pulled over by a police officer and are asked to step out of the car and perform field sobriety tests and you refuse, you will be facing no penalty. However, if you have been issued a Medical Marijuana card and a police officer asks you to step out of the car and submit to a field sobriety test and you refuse, your license will be suspended for 12 months. When you are issued a Medical Marijuana card, you give consent to perform standardized field sobriety tests whenever you are requested to do so by a police officer. A police officer must have an independent cannabis-related factual basis that gives him a reasonable suspicion that you are driving under the influence of cannabis before requesting that you submit to a standardized field sobriety test. This requirement can cause problems. What happens if you refuse to perform a field sobriety test because you are not feeling particularly well that day or are unable to because of your disability? After all, you are disabled enough to qualify for a Medical Marijuana Card. What happens if you are taken to a hospital and take a blood test that reveals that you have 5 nanograms or more of THC, the active ingredient in marijuana, in your blood and prosecutors want to use this to try to prove that you were Driving Under the Influence? 5 nanograms of THC in your blood is the amount of THC that would make a non-Medical Marijuana patient charged with a DUI guilty of a DUI. However, a blood test does not accurately measure the effect that marijuana has on the human body. Marijuana does not react the same way that alcohol does when it enters the bloodstream. 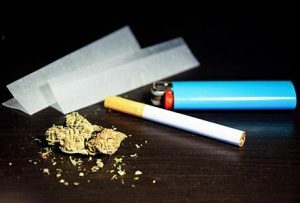 When marijuana is ingested, it will initially enter the bloodstream but will rapidly exit the blood and enter the fatty sections of your body. Your brain has several sections containing fat and the marijuana will travel to the fatty sections in your brain. If someone ingests marijuana, a blood test taken shortly after the marijuana is ingested may show a high level of THC in the blood. But if the blood test is taken two or three hours after the marijuana is ingested, the blood test may show a low level of THC in the blood even though the person may still feel “high” because the marijuana has moved to the brain. Heavy and regular users of marijuana, like many Medical Marijuana patients, will have high THC levels in their bloodstream all the time. If you are a Medical Marijuana patient and are charged with a DUI, you can fight the case in Court. You can contest the reason for your vehicle being stopped by the police, or the justification for requesting that you submit to a field sobriety test, or the results of the field sobriety test, or the results of any blood tests. But this could be a very expensive and difficult ordeal to go through. Many Medical Marijuana patients are disabled and are unable to afford the legal fees required to put up a fight like this. That’s one reason why it’s unfair to place a bulls eye on Medical Marijuana patients. This is something that should be addressed by lawmakers. It is unfair to Medical Marijuana patients to increase the likelihood that they will be pulled over for no reason. There has to be a better way of doing this. James Dimeas is a nationally-recognized, award-winning, DUI lawyer. James Dimeas has been handling DUI cases for over 25 years throughout Chicago, Cook County, DuPage County, Lake County, and Kane County. James Dimeas has been recognized as a “Best DUI Attorney.” Expertise named James Dimeas as a “Best Criminal Defense Lawyer in Chicago.” The American Institute of Criminal Law Attorneys have named James Dimeas a “10 Best Attorney for Client Satisfaction.” The American Society of Legal Advocates have named James Dimeas a “2018 Top 100 Lawyer.” The National Trial Lawyers have named James Dimeas a “Top 100 Criminal Defense Trial Lawyer.” James Dimeas has been rated “Superb” by AVVO, the highest rating possible for any lawyer in the United States. If you are being charged with a DUI, you can contact James Dimeas anytime for a free and confidential consultation. You can always talk to James Dimeas personally by calling him at 847-807-7405. Can You Be Charged With a DUI If You Pull Over “To Sleep it Off”? by James G. Dimeas, Chicago Criminal Lawyer Blog, November 9, 2017. What Could Happen if I am Arrested and Charged with Possession of Marijuana in Illinois?, by James G. Dimeas, Chicago Criminal Lawyer Blog, August 1, 2017.